Marex present the project of the 375 which is based on the hull of its award winning and much praised 370 Aft Cabin Cruiser. Apart the different looking but still family feeling design, two important features differentiate the 375 from the 370, no aft cabin, and the choice of single or twin engine options. 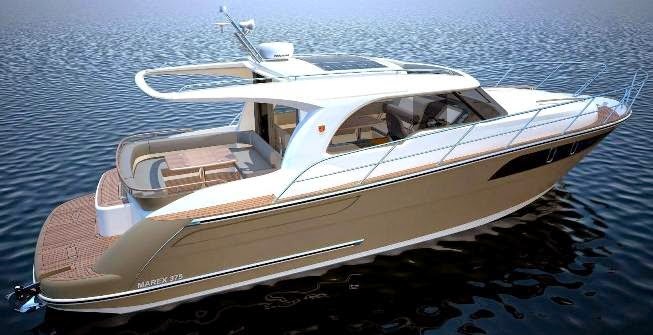 The Marex 375 is an enclosed hard top sport cruiser with two important seating areas; one outside on the aft deck with a large C-shaped settee resting to port side, and a similar layout dinette inside. The galley is also located on the main deck with the Marex design team concentrating living up top. Below is two cabins with two double berths; owner to forward, and a guest at midships. A shower head is located to starboard.